Happy Halloween, everybody! I hope that you will have a great time trick-or-treating, and dressing up in costume, and eating candy! Google has made a new Google logo for this occasion, as usual. It is not just a picture, its a game! 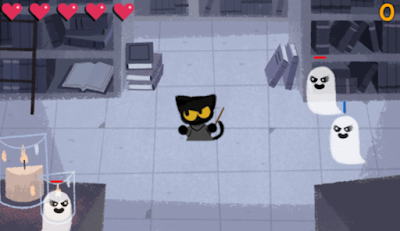 The logo shows a wizard cat and ghosts about to attack him. The play button and the window inside the house are animated. The game is very simple: when you see a ghost approaching the cat, draw the ghost's symbols in order to defeat the ghost. If a ghost touches you before you draw all the symbols, you lose a life. The normal symbols that you can draw are a horizontal line, a vertical line, an up arrow, and a down arrow. If you see a lightning bolt symbol, draw it to make most of the other ghosts in the area disappear. Drawing a heart when there is a ghost with a heart symbol nearby will result in you earning another life. At first, the game is very easy but as the symbol combinations become more complicated and the ghosts start to move faster, it gets extremely hard. My best score is level 3. Can you beat it? As I told you in my previous post, I will be Kylo Ren and my little brother will be Yoda from Star Wars. My friend Xiang (you probably know him as the creator of my rival blog, "Past Now Future") is dressing up in a homemade criminal costume. He will wear a ski mask and will use a huge sack to carry candy! We will go trick-or-treating together with Xiang later today. Have a fun and spooky Halloween, everyone! BBBBBYYYYEEE!! !